This is a panorama of Vancouver’s Coal Harbour. I took this from Stanley Park one night and I wasn’t alone. Not only is this a popular spot for photography, Vancouver has a lot of photographers. There were several other photographers out with their tripods composing their shots of this great city. This image of Vancouver is like an acorn of time, it’s fun to go back and examine the details later. In this case I used three vertical eight-second exposures that I stitched together. I enjoy making panoramas with a full frame camera because of the amount of detail in the image. Whenever I print these I marvel at the smallest details. One reason photography is so fun for me is because I get to go back and look at a scene in quiet contemplation. At the time there may be a lot going on and it’s easy to miss things. But I tend to see more things later when looking at images. I’m like a chipmunk gathering acorns of time, holding them and then enjoying them later. Anyway, I almost didn’t take this photo because it’s been done so many times before. But I’m glad I did, if for no other reason than I get to go back and enjoy the scene now. 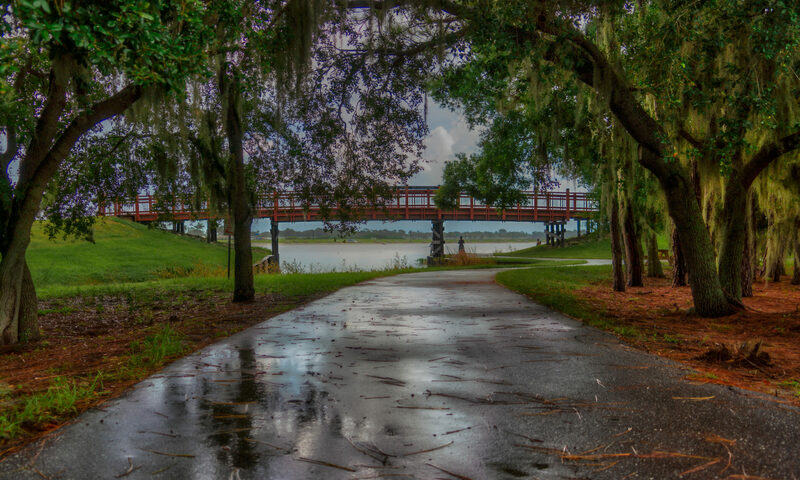 A couple of weeks ago after some afternoon rain I drove up to Fort DeSoto Park to take photos. As I looked back I noticed this rainbow over the bridge. From where I stood it appeared to span about 8 miles from one side of the Sunshine Skyway to the other. To get this photo I took four vertical images, from left to right and stitched them together to form a panorama. I have mixed feelings about this image. On the one hand the placement of the rainbow over the bridge is nice and if you look close there’s even a double rainbow. If I didn’t know better I might think it was photoshopped. On the other hand the scene lacks drama. That aside I decided to keep it as is, an image of a rainbow over the bridge without much drama. With some images I take a lot of pains to simplify them in post production. I feel it’s important to not have distractions in an image. This one however needed none of that, just water, sky, bridge and a rainbow. Sometimes images like this just demand to left alone because they have a voice all their own. In this case I suppose I have to agree with that. First thing in the morning the water here is like glass. This is Benderson Park, an international rowing venue and I came here on Saturday hoping to find some athletes on the water. Save for the early morning joggers the place was deserted. That presented different opportunities on account of the clouds in the sky so I went with plan B. Early mornings are not easy for me. I do get up and go out sometimes, but I can be a little grumpy; it’s a good thing I’m usually alone. It reminds me a little of my morning workouts. I, and about 20 others, show up at the gym several times a week for a bootcamp-style workout. Several of us are less than chatty at 6AM. However by the end of the workout we’re all smiles and high-fives. That’s how I am with sunrise photography. I leave the house in my car fighting the urge to turn back. I’ll get a coffee at Duncan Donuts and proceed to a location. Once there I’ll look around and take a few shots. Maybe they’re not so great and again I begin to doubt the effort. But, if I stick with it and put one foot in front of the other, something might catch my eye, perhaps the light changes. Before you know it I am fully engaged in composition and capturing the light. Thirty minutes later I’m in the zone ready for more. And that, in a nutshell, is my morning ritual. This was taken off the coast of British Columbia a couple hours out of Vancouver. I was on an Alaskan cruise and spending time on the balcony watching the scenery and drifting off. Its like soothing scenery overload. It puts you in a relaxed state of mind and before you know it, La-La land. Actually it was probably more a reaction to the massage. As we boarded in Vancouver the spa personnel were out offering first day discounts on massages. Having a sore back I jumped at it. After that I headed back to the room and sat on the balcony alternately snapping pictures of the coast and falling asleep. A good way to start the week. Many of us lead hectic lives and when we slow down our bodies use the opportunity to recharge. I wish I could do that more often, but then maybe I can on weekends or a little every day. In any case it was good to get away, watch the scenery go by and not think about a thing. This scene is a panorama from four images I shot handheld in Bradenton last night. Because I’d been away in Alaska it’s been a few weeks since I was here. So camera in one hand and dog leash in the other I proceeded down the riverwalk just before dusk. What I wasn’t expecting was the number of people out milling around, there were hundreds, much more than usual. In two words, Pokemon Go. This was the scene as people played Pokemon Go at Bradenton’s Riverwalk. It was an unusual sight, I’ve never seen anything like it. I felt like I was in some sci-fi flick were everyone was connect to a central brain and I was watching from the outside. But, as I observed, people were talking, walking from place to place, and generally having fun. I thought to myself that these people would otherwise be at home watching TV yet they are out on the riverwalk in the evening. When I stopped to take this picture, several others noticed what I was doing and turned around to take similar photos. They couldn’t have done that sitting at home. Maybe because of the game a bunch of folks got outside, mingled, and had a chance to see some things they don’t normally see. If it takes a game to do that then hey, why not? I noticed someone sitting on a rock at dusk in the warm summer air. I took this last week when I went to Fort DeSoto Park in St Petersburg. I can never get enough of this place, no matter how many times I come back I always find something to take pictures of. That’s partly because I live in an urban area and I seek out places with open spaces; this is one along the water. This time of year we get clouds every evening on account of the afternoon storms. It seems the more severe the thunderstorm the better the clouds afterwards. Even if I don’t have anything to take pictures of I could just focus on the clouds and the colors at dusk. When I took this I was standing next to the fishing pier about 50 yards away. It was dark enough that I couldn’t see the person sitting on the rock. That’s a testament to the Sony sensor in the A7RII camera that I use. I can take pictures of something I can’t actually see with my eyes and then bring it to light with post processing. That’s incredible and opens up all kinds of opportunities for photography. I’ve mentioned this before but I keep being amazed at the camera nonetheless. All that aside, the weekend is coming and I’m looking forward to more thunderstorms, the bigger the better. This is a typical scene from the South Jetty in Venice Florida. People showing up to watch the sun go down is a Florida pastime. It’s a natural thing to do especially if you come visit from somewhere else. Most people in Florida are from somewhere else, even if they live here. Florida is one of those places where people are migrating to. As for myself, I was born and raised in California. It used to be that everyone relocated to California from somewhere else. I was born there and relocated in the other direction. But California is a beautiful state to visit, I love going back and as a photographer I see so much more than I did growing up. Other than the sound of the waves and the sunsets there is not much resemblance between California and Florida, they both have their own unique beauty. But waves and sunsets are a good thing to have in common. I did a short hike through the Tongass National Park in Ketchikan Alaska. Despite the northern latitude this is a rain forest and Ketchikan receives the second highest amount of rainfall in the world, second only to the Hawaiian Island of Kauai. It goes without saying that the predominant color was green in all directions. In fact it was raining during the hike, a light pleasant rain, however it was warm at the same time so a light poncho was all I needed. Tongass is the largest national forest in the US and I saw only a sliver of it. These cedars are used for a lot of different things including the making of musical instruments. They are also used in the brewing of Cedar Top beer up in Skagway. Don’t bother looking it up (I just tried), it’s a local brew only. I know this because on advice of a guide I tried it at a bar in Skagway. It took a pint to get used to the flavor and after that it was smooth sailing on pint two. Beer aside, I stopped on the trail when I came to a clearing and took this image. It just seemed kind of mystical with the low clouds over the mountainous terrain. And of course I was wondering how they got those cedar tops into the beer.